So, I can’t really properly judge newly famous media critic Anita Sarkeesian’s videogame criticism because I’m not a gamer. I can, however, judge her reviews of books and movies, and if her 2012 video about The Hunger Games is any indication, her commentary runs the gamut from the banal to the laughably wrong. Oh, and before you go on, there be spoilers here for The Hunger Games, Catching Fire, and Mockingjay. Proceed at your own risk. 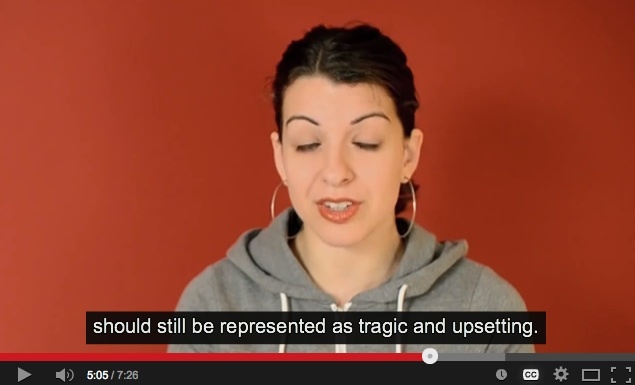 And now, here’s Anita Sarkeesian. Okay, first of all, unrelated to gender: at about 55 seconds in, Sarkeesian makes a passing comment about how the premise of the book is unrealistic because there’s no way people would give up randomly selected kids to participate in a fight-to-the-death spectacle without a fight. Has she actually read the damn books? Because I think it makes perfect sense in the context of the Hunger Games universe. The people from the districts are too cowed to rebel. Plus, the Hunger Games system is actually a combination of carrot and stick — well, lots of stick and a little carrot. If you win, you become a celebrity and a hero, and not only your family but your town reaps major economic benefits. Then, there’s a discussion of Katniss that consists of a lot of statements of the obvious. She’s not reduced to her gender, she’s not sexualized or objectified, she shows sympathy and compassion for her family and friends. One of Sarkeesian’s pet ideas is that a truly feminist heroine has to challenge the “patriarchal value system” not only with regard to gender roles but also by prioritizing compassion, cooperation, and non-violent conflict resolution over competition, dominance, vengeance, and so on. So, for instance, she refuses to consider Mattie Ross in True Grit a feminist heroine, because among other things she doesn’t show enough emotion and doesn’t question the idea that death is appropriate retribution for her dad’s murderer. I have to say that I find this idea deeply offensive. If a conservative wrote that a female character was a bad model of womanhood because she’s insufficiently emotional and too vengeful, he (or she) would rightly be excoriated as a sexist. So why is it okay for Sarkeesian to declare a female character to be a bad model of feminism because she’s too much “like a man”? I have no words for how obnoxious that is. Well, I do, but they’re the kind of words that would violate my own rules about civility in public discourse. 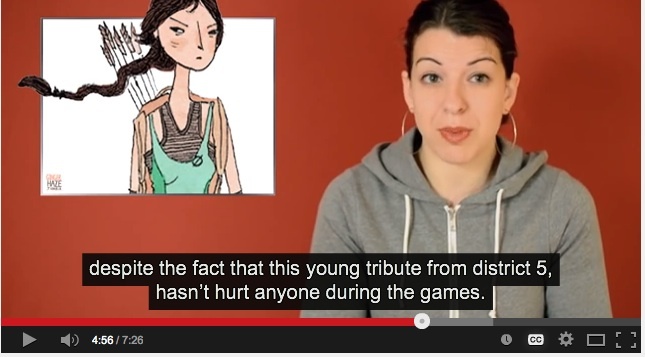 Katniss mostly meets Sarkeesian’s True Feminist test (whew!). 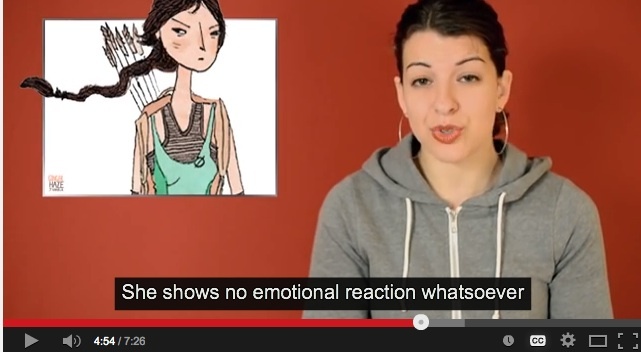 Except that Sarkeesian manages to give her a passing grade by seriously misrepresenting the books. For instance, she asserts (at 3:56) that Katniss remains “troubled and disturbed at the idea of personally murdering another human being, even within the context of the death match.” Reeeally? Re-read the start of Chapter 18 of The Hunger Games, where Katniss kills the boy who has just mortally wounded her friend and ally, Rue. I lie smoldering in my bag for the next couple of hours, really thinking that if I can get out of this tree, I won’t have the least problem taking out my new neighbor. My instinct has been to flee, not fight. But obviously this person’s a hazard. Stupid people are dangerous. 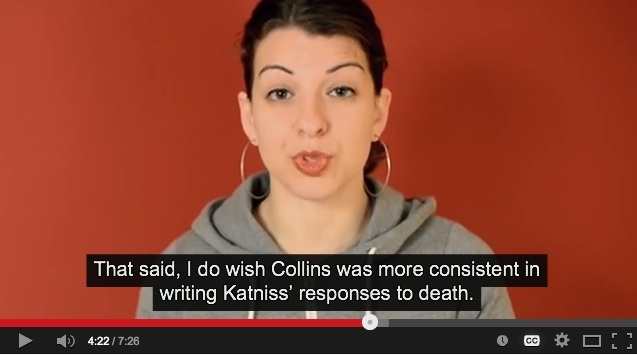 In fact, at 5:55, Sarkeesian contradicts herself by noting (when discussing the ways in which Katniss is shown as traumatized by violence) that near the end, she aims an arrow at Peeta’s heart when she thinks he’s about to kill her. First of all, while Foxface has cleverly stayed out of the action, she was hurting or trying to hurt Katniss and Peeta by stealing their food supplies. Secondly, Katniss also remains unfazed by the deaths of several other tributes who haven’t hurt anyone. 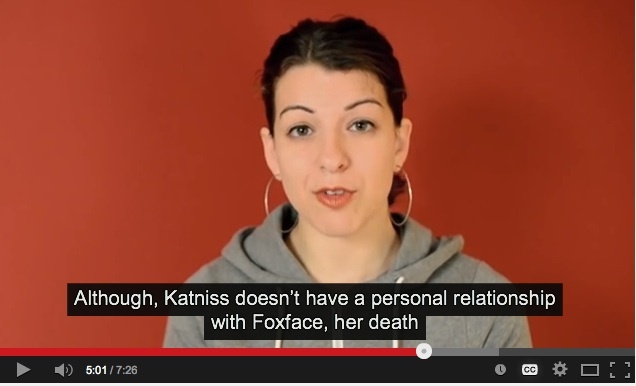 At first, I was going to say that Sarkeesian’s objection to Katniss’s lack of grief at Foxface’s death betrays her sexism, since Katniss also shows no grief at the murder of several harmless males (like the boy in Chapter 11 with whom she struggles for a backpack at the Cornucopia and who is killed right in front of her — she’s only repulsed by being splattered with his blood), but after re-reading the scene where the girl who lights the fire is killed, I had to conclude that Sarkeesian is not being sexist; she’s just being stupid. The rest of the seven-and-a-half-minute video is taken up by a discussion of how male heroes are typically portrayed as suffering no emotional repercussions from violence and how refreshing it is that Katniss struggles with such repercussions. 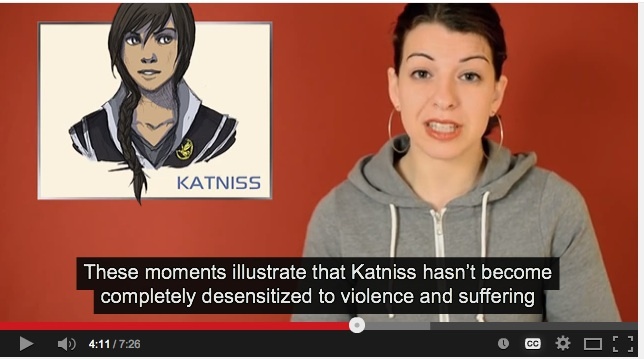 But ironically, in trying to squeeze Katniss into her politically correct little box of Compassionate Feminist Hero, Sarkeesian totally dilutes one of the strongest themes of the trilogy: that being forced into a world of brutal violence does have a dehumanizing effect. Is there a place for intelligent media criticism that focuses on gender issues? Sure thing. But the fact that Sarkeesian has emerged as the leading voice in such criticism right now ensures that it’s going to be propaganda, not analysis.